After a year in the making, the International Marine Mammal Project recently released a short video about dolphins that I co-wrote and edited. Lives of Wild Dolphins shows how dolphins are highly intelligent and emotionally advanced – and how they deserve world-wide protection from human harm and captivity. Dolphins should not be held captive for our entertainment and profit. Check out this inspirational short video and please feel free to share it with others! 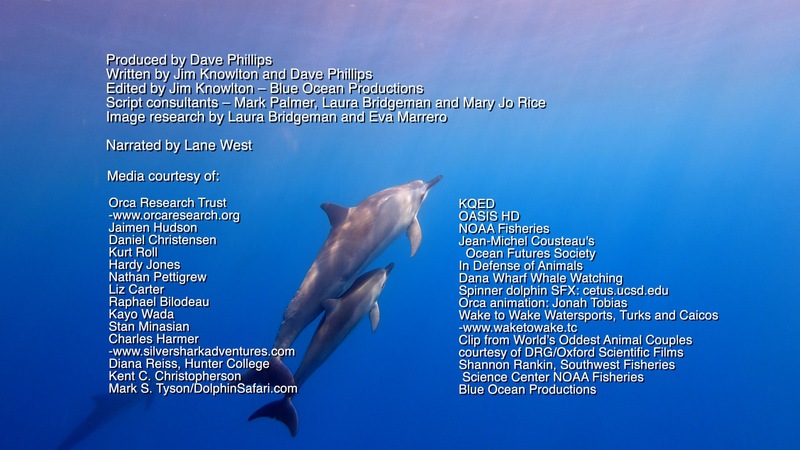 To create the video, I worked with the talented and passionate team at the International Marine Mammal Project, including Executive Director Dave Phillips, Mark Palmer, Laura Bridgeman, Mary Jo Rice and Eva Marrero. We searched for the most amazing video we could find that illustrates how dolphins live in families, have language, learned behavior, how they love to play, and how the parts of their brain that control emotion and cognition are are even more highly developed than in humans. The short video works to share this information to help inspire people to understand that taking dolphins from the ocean, away from their families, and putting them in concrete tanks where they can no longer swim freely and where they must perform tricks during entertainment shows to receive food is inhumane. Its important that we support international protection for dolphins because dolphins are still being captured for captive marine mammal parks that continue to be created in many countries around the world. When you visit or support any park that has captive dolphins, you are supporting the idea that its okay to hold these advanced animals captive – and the idea that it is okay is fueling the creation of new captive dolphin parks. Its time for this tragic practice to be part of our unfortunate past. We kept dolphins captive before we understood that they are magnificent animals that deserve to live free in the ocean with their families. And, now that we know, we need to protect all dolphins from human harm and captivity, and we need to move currently captive dolphins to enclosed ocean sanctuaries, where they can once again experience the ocean and where they can be taken care of for the rest of their lives. The Whale Sanctuary Project is building a model sanctuary where captive whales and dolphins can be rehabilitated and where they can live permanently in their natural environment.